I had an engaging conversation last evening with past early childhood friends about developmental stages in learning. I was in Orlando to talk about developmental math sequences. We expressed our frustration about how many core standards are not listed in developmental order. It is left up to the teacher to make sure they are introduced in a sequence that will provide a foundation for learning. This is initially why I began to create the POCET tracking system for preschool. Math is a great example. It is critical that a child can classify and sort by attributes prior to being asked to be aware of repeating patterns. Literacy experts have also concluded that phonemic awareness, letter recognition and print awareness are predictors of reading success in first grade. It is imperative that we help early childhood teachers understand the developmental order of skills so that empty, unsupported activities aren't the norm. We must build that solid foundation of learning. 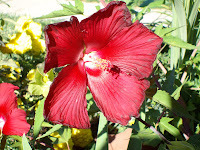 We have a hardy Hibiscus in our yard which bloomed for this first time this fall. It is amazingly beautiful with a dark red bloom that measures approximately 8" across. The sad part is that the blooms only last 1-2 days. As there are many blooms on our plant, we have been enjoying them for a couple of weeks. These flowers have been reminding me about just how precious time is when we are looking at our children. Because of developmental windows, we don't have the luxury of hit-and-miss support for foundational learning. We need to make the most of each minute that these little ones are soaking up knowledge. Their brains are busy building connections that will affect the rest of their lives. The anticipation in children is just as breathtaking as my beautiful Hibiscus. The difference is that when we cultivate and enrich a child's joy of learning, it will most definitely last more than 1-2 days. Imagine blooming an entire lifetime! 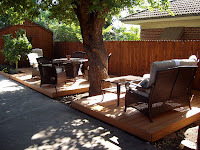 We just recently completed a deck that has been in the planning for several years. As I sit out under the tree that grows from the middle, I am not happy that fall is on the way. The temperatures are cooling and darkness is coming earlier all of the time. But, I have my deck and I want fall to stop coming for a while. I want to enjoy the lovely summer evenings outside. But, time will keep marching on. I had the same feelings about stopping time as my children continued to grow older. Now I feel it occasionally with my grandchildren. Can't she stay two for just a little longer? It is the nature of things to watch time pass. I guess our challenge to make sure each day is better than the last one.